DO YOU HAVE A RAINFOREST MIND? Admit it. You exude effervescence, exuberance and ebullience. Maybe it’s in the way you talk. Or the way you write. Maybe it’s in how you gush over photos from the Mars Rover. Or how you swoon over Sherlock. In my last post, I briefly explained “overexcitabilities.” (OEs) The expression comes from psychologist K. Dabrowski‘s research on giftedness. He says that gifted folks have lots of them. Like when your imagination takes you into mysterious universes where you create new worlds with complex languages. Or when you must obsessively research NASA’s potential study of manned blimps in the upper atmosphere of Venus. Or when your sensitivity to the sound of people chewing makes you want to cry. If you don’t feel so effervescent, exuberant and ebullient right now it may be because you were raised by chainsaw parents or had painful schooling experiences. Or perhaps it’s because you read the newspaper. I understand. But I’ll bet you anything that before you were slowed down, quieted down and dumbed down, overexcitable was your middle name. Now, I know I’ve told you in another post that I’m BG. (barely gifted) Even so, I do have some overexcitability. My hair is effervescent, exuberant and ebullient. Overexcitable. And let me tell you, I’ve tried to control it, contain it and dumb it down. To no avail. But I’m done with that. No more hiding. No more shrinking. No more hair-obliteration. Let my curls be seen. Let them express themselves. In all of their giftedness. 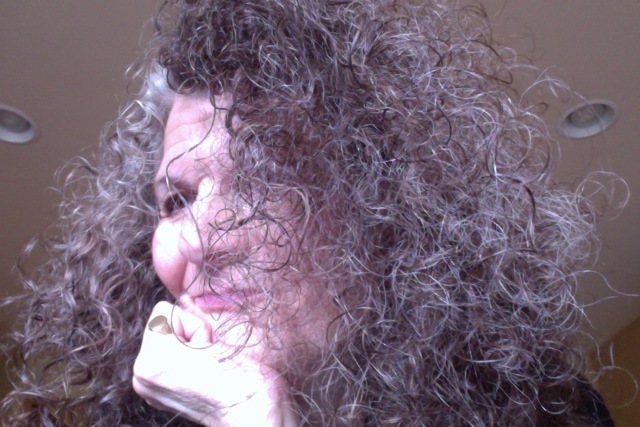 To my bloggEEs: How are you hiding and self-obliterating? How can you allow more of your rainforest hair mind to shine? This may seem to be in contradiction to my last post when I talked about a type of loving containment. It’s not. What I’m writing here is about finding your true Self and living your authentic hair life. What are your thoughts, feelings and questions? Tags: authenticity, Dabrowski, gifted adults, Intensity, overexcitabilities, sensitivity | Permalink. 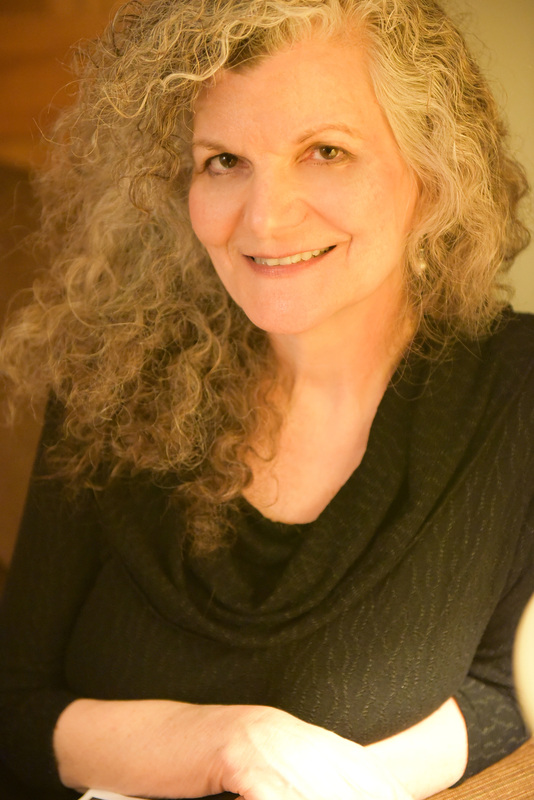 I'm a psychotherapist and consultant in private practice in Eugene, Oregon. I specialize in counseling gifted adults and consulting with parents of gifted children. The label "gifted" is often controversial and confusing. I use the metaphor of the rain forest to describe this population. Like the rain forest, these individuals are quite complex, highly sensitive, intense, multi-layered, and misunderstood. They're also curious, idealistic, highly intelligent, creative, perfectionistic, and they love learning. I've been an adjunct instructor at the University of Oregon and a guest presenter at Oregon State University and Pacific University. I've written articles on giftedness for the Eugene Register-Guard, the Psychotherapy Networker, and Advanced Development Journal. 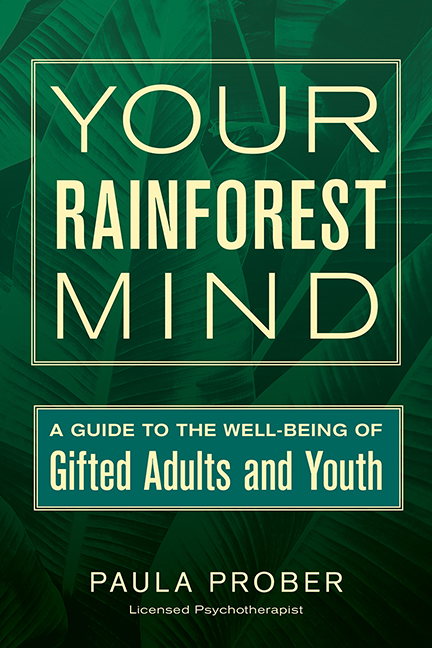 My book, Your Rainforest Mind: A Guide to the Well-Being of Gifted Adults and Youth, was released in June 2016 by GHF Press and is available on Amazon or at your independent bookstore. “Or when your sensitivity to the sound of people chewing makes you want to cry.” <—- Oh yes to this. 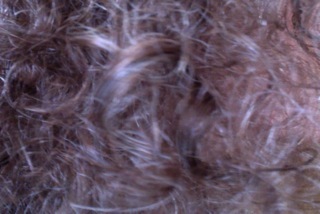 My hair has some OEs going on today, too, as do my children. Happy New Year, Paula! Thanks Caitie! Happy New Year to you and your family. Haha! This is so on the $ for me. I’ve always had several “overexcitable” traits. My fashion sense, my thoughts, my interests. I finally gave in to the fact that I have wild WILD hair! In the past I would typically straighten it. Occasionally I would wear it curly but I put so much product in it and touched up certain cowlicks with a straightener. Around a year ago I started “letting go” and put a little colonizer in my hair but just let it air dry and be wild! Yes to letting go and getting wild! Oh yea… And the sound of chewing, or cutting food, or the level at which my boyfriend talks. SO many things are ear piercing! Does light sensitivity fall under this at all too? Oh yes. Sensitivities and overexcitabilities can be auditory, visual, tactile, and more. Oh how I remember feeling things so intently as a child, the beauty of the sunset could make me cry and lose track of time. I got so absorbed in it that I missed getting back in the car on Route 66 traveling with my family across country. Luckily I was only six and they missed me a few miles up before I even knew they were gone. But things like this happend all the time. No one seemed to understand the intensity of my feelings including myself. Beauty make me happy, especially sunsets. Funny thing is I don’t feel that way anymore. Goffman, Erving (2009-11-19). Stigma:Notes on the Management of a Spoiled Identity” (p. 10). Simon & Schuster, Inc. Kindle Edition. I just started reading through Goffman’s classic work on stigma because I have been thinking about stigma and giftedness (and stigma and race and stigma and gender and stigma and religion, etc). Stigma takes all the fun out of overexcitabilities. It’s like having gifted hair in Mississippi. Holbart. Can you explain this a bit more? “Stigma takes all the fun out of overexcitabilities…gifted hair in Mississippi.” Tell us more. reminds me of the time. . .watching a play . . .woman in front of me opening a package of mints . . the sound . . .the smell . . .but no that belongs in the HSP forum. I think there’s lots of overlap with the HSP and the rainforest-minded, Kathleen. Do you find that to be true? How is that that you keep reading my mind!! Yes, I almost wrote: “don’t you find there’s an overlap” etc. Probably both groups have problems with christmas music in chain stores, among other things. Ha ha! Love it! My boyfriend definitely has overexcitable hair! And isn’t it true that we rainforest types have minds of our own, are different every day and are unmanageable! Thanks for writing, Antarmukhi. Wish you a merry christmas & a happy new year! Our son has overexcitabilites wanting to ‘prove beyond doubt’ why things are so in terms of life and existence. I have to say that I have struggled at times to support him as those overexitiibilties at times have lead to anxieties when the research didn’t match the concept particularly around thoughts of faith and a higher being. Others(well meaning) view is to squash and bring back to the reality of a certain ‘normal’ where he doesn’t fit so well. Any advice or direction would be really helpful as we attempt to navigate our way with him. Chrissy, There are some great resources at giftedhomeschoolers.org. (You don’t have to be a homeschooler.) Look for their blog hops. Lots of very knowledgable parents writing on a topic. (Then you can follow the blogs of the ones who speak to you.) Also hoagiesgifted.org and sengifted.org. All great websites for parents of gifted kids. First, you are not crazy! I haven’t heard this level of body awareness described in the OE literature and I haven’t seen it in my experience. But it certainly could be included. That said, it could be that what you’re describing is less common than the more typical OEs you mention in the first part of your comment. I’d be inclined to say that you’re extraordinarily tuned in to your body and possibly your intuitive abilities are also advanced. This might not be an OE per se but more your rainforest mind’s greater perception, awareness, sensitivity, intuition… You might want to check out Jessie Mannisto’s blog. She writes in depth about OEs and Dabrowski. You could also contact her and ask her this question. I’m guessing she’d get back to you and enjoy a conversation! https://www.thirdfactor.org/the-overexcitable-experience/ Thanks for asking! Oh, thank you so much for your insight. You may be right! The distinction would make sense. Though the sleepiness after carbs has a more objective feel to it – I have been diagnosed with idiopathic hypersomnia. But after having recently cut carbs to lose weight, I am finding that the daytime sleepiness has almost disappeared (at least for now)! I wonder why. On the awareness/intuition side of things, I would add the intensity of my dreams. I have (and remember) such intense dreams that I sometimes wake up and spend hours feeling like I have actually lived through the dreamed experience. In fact, it will sometimes occur to me that one of my “memories” was actually a dream. Plus, I’ve had a few lucid dreams. One in particular was such a magical experience that I hope to have another like it one day. Some of my dreams can be troubling but others leave me in awe. Interestingly, I am also very intuitive when it comes to other people as well. Though in that case, it has more to do with their emotions, but sometimes it’s also their physical energy. Thank you for the reference to Jessie Mannisto’s blog. I’ll check it out! I’ve read that simple carbs and maybe particularly wheat or gluten can have this effect on some people. You might want to read more about that. Gifted folks can definitely have vivid dreams. Thank you so much for flagging Third Factor, Paula! And Raz, I’m so happy to hear that you found it useful. I was monitoring referrers for some other purpose today and happened to see that some traffic had come from Paula’s site…how cool to pop over here and see that someone had found all this OE stuff I go on about useful. I knew I couldn’t be the only one! And Raz, I very much relate to what you said about about stimuli and even sensing internal organs. I also need the bed made, am sensitive to smells, get immediately hungry, etc. Hope you find some more interesting material on our site! My pleasure, Jessie. I’m glad I have somewhere to send folks. Congrats on the launch! Overexcitability, moreover, is not merely mental, but physiological—an all-encompassing property of the central nervous system. Consider this fun fact: if an average person closes her eyes and someone presses on her eyelids, her heart rate will fall ten percent. If someone does this to a highly excitable person, hers will drop fifteen to twenty percent, according to this presentation by Bill Tillier at the 2016 Dabrowski Congress (jump to about 16:30). I am utterly blow away. Great, Raz. Jessie’s writing/research may be just what you need!! Gifted Children and Adults -- Why Are They So Misunderstood? Too Sensitive, Too Dramatic, Too Intense --What Is Emotional Intelligence? If I'm So Smart, Why Am I So Lonely? Your Rainforest Mind — The Book — Click on the image to buy my book! The material in this blog is for informational purposes only. It's not a substitute for meeting with a counselor. If you're in need of counseling, contact a local provider.